Diversity in the workplace is vital to the innovative processes which help a company thrive in the modern business environment. Due to this, here at itas we promote this exact idea! 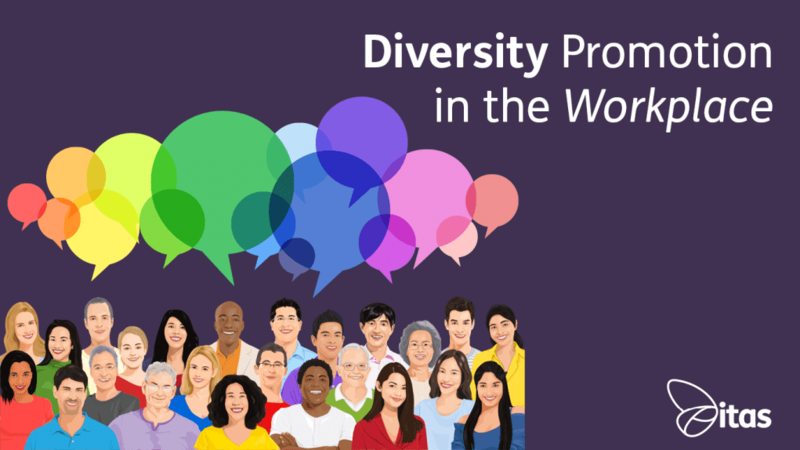 Providing equal opportunity for all ethnicity, genders, and ages, we see a diverse workplace as a successful workplace. We thrive to break the old-fashioned glass ceiling mantra, removing workplace inequality, to really bring us into the 21st century. I have only worked here for a week, but I can tell issues surrounding workplace discrimination are absent here. For example, the glass ceiling for minority groups, job segregation and other forms of discrimination are not issues which are remotely related to itas. Friendly staff with positive attitudes don’t allow for it, which is more than evident here! Multiculturalism is key to promoting a wide variety of ideas and perspectives. This gives the best chance of coming up with new and creative practices to maximise productivity and efficiency. A culture of inclusion for all can only be beneficial in helping ourselves, and hence helping our customers, be better! This is relevant on a global scale or simply a growing firm supporting Sage 200 and Sage Live. We here at itas see managing organisational diversity as an opportunity to enhance our competitive advantage. We recruit the best and brightest, regardless of their background, to provide the best experience for our customers. As Richard Branson once said, “Clients do not come first. Employees come first. Take care of your employees, and they will take care of your clients”. The data above clearly shows the problems that exist in relation to the gender pay gap. However, this is not to say that there is only gender inequality regarding financial rewards. There are also ethnic, cultural and age inequality, among a number of others. At itas, we aim to break not one, but all of these prejudices within the workplace. Not just relating to pay, but also equal work opportunity and potential rewards for outstanding work for all. Although we may not like to admit it to ourselves, there is an element of unconscious bias when putting our trust in certain people. This can be due to factors such as our upbringing or past experiences for example. This doesn’t mean we can’t change for the better and choose not to judge a book by its cover. An unlikely source of wisdom in relation to this issue can be sourced from Harper Lee’s ‘To Kill a Mockingbird’. Specifically, where Atticus Finch says “You never really understand a person until you consider things from his point of view… Until you climb into his skin and walk around in it.” This has never been more true and relevant in today’s society! The select few can be too quick to judge a person on their accent or how they present themselves for example. Therefore, it is vital to break down this barrier to remove all forms of inequality within the workplace. As a result, this will ensure a more prosperous future for us all. Here at itas, we promote the expression of our employees’ views and ideas. Operating a loose grip on our staff to make sure they follow company rules, coupled with the ability to express themselves. Maximizing our employees’ potential to be the great employees we know they can be is key to our success! Our core values consist of promoting knowledge as a valuable good and the belief that every customer is unique. Also, unlike the popular show ‘The IT Crowd’, we are very easy to get along with and are happy to help! These are just a select few core values we promote. We feel that these core values lay the best foundations we can to ensure people of all ages, gender, race, religion, sexuality and educational past feel welcome at itas. I am only in my infant years as an employee within the working environment. Even so, it is clear to me that a diverse workforce is a happy and productive workforce. Thankfully, this is obviously a belief shared within itas! A word used too frivolously now days is “perfect”. Space for improvement is always available! Within the modern business environment, as soon as you stop to admire what you have achieved, you’ve already been left behind. At itas we aim to constantly innovate, move forward, and challenge the status quo to make sure we are not left behind. This is why diversity in the workplace is of great importance to us!